For more than 200,000 children in Massachusetts, skipping a meal is not a choice: it is a very real part of their daily lives. And because these children come from homes where food is in short supply, they depend on school meal programs to stay healthy, strong, and to realize their full potential. Through thoughtfully designed and kid-proven programs, Project Bread makes sure children of all ages get healthy food where they learn and grow—and begin to develop life-long healthy eating habits. Hungry children have a hard time concentrating and learning. They miss more school, drop out more often, score lower on standardized test, and have trouble competing with their peers. What they lose by being hungry they’ll have a hard time making up. Project Bread works to enroll low-income children in federal nutrition programs, improve the quality of the food served, make nutritious food available where kids learn and grow, and teach school food (and preschool) kitchen staff and parents how to prepare nutritious, fresh, kid-tested meals on a limited budget. We work with school districts and partners across Massachusetts to ensure that every child starts the day with a healthy breakfast. For nearly 20 years, Project Bread's Child Nutrition Outreach Program has partnered with the MA Department of Elementary and Secondary Education to advocate for more than $2 million annually for Universal Free Breakfast programs in the poorest elementary schools—a non-stigmatizing way to help kids the nutrients and calories they need to learn and grow. 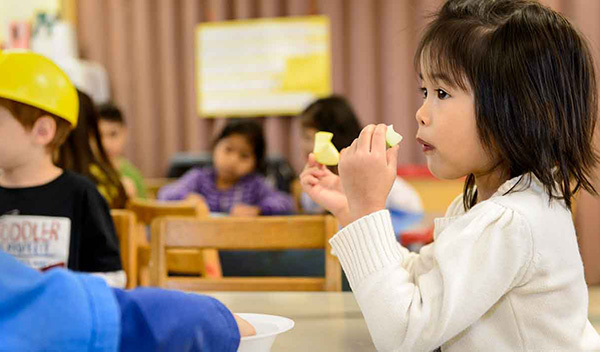 As Share Our Strength’s 2013 No Kid Hungry Ally in Massachusetts, we also bring together chefs and school food experts to create menus for healthier breakfasts that are served in the classroom. Learn how your school can get involved in the fourth annual School Breakfast Video Contest. Chefs in Schools began as a pilot project in three Boston public schools: we brought chefs into cafeteria kitchens to work with staff to create healthier meals—on a public school budget—that children would find tasty and visually appealing. It worked. We’ve since expanded to Chelsea, Lawrence, and Salem with leadership support from Arbella Insurance Foundation and additional support from the Trefler Foundation and the Jessie B. Cox CLT - Cox Family Fund. And we partner with Harvard School of Public Health to measure the ongoing efficacy of this important program. Read the published results of the successful intervention in Boston. Chefs in Head Start reaches some of Massachusetts’ youngest residents—toddlers and pre-K children—and their families. The program introduces healthy foods to Head Start students through hands-on activities, stories, and tastings; teaches parents how to make familiar foods healthier on a limited budget; and trains kitchen staff how to make more healthy food. For most kids, summer is a time to relax. But for children who rely on school meals, summer can feel like an endless struggle. With the help of our community partners and policy makers, we promote the Summer Food Service Program to help ensure that no child is hungry when school is out. In 2013, over 50,000 students in Massachusetts enjoyed healthy meals at one of nearly 900 sites. And summer meal programs do more than just provide children with a healthy meal. They are also paired with enriching activities that keep kids active and safe: physical activity, arts, and educational lessons—giving them the boost in health and energy and the leg up they need as before returning to school in September. Let's Cook Healthy School Meals is a first-of-its-kind tool to help school administrators and kitchen plan and prepare healthy meals for students that they will want to eat. It meets the new 2012 USDA school meal requirements—and offers 100 recipes that have been kid-tested in cafeteria kitchens. In partnership with Chef Didi Emmons and the Chefs in Schools Program, Project Bread solicited recipes from school food professionals across Massachusetts, then tested and refined them to compile this valuable resource. Download your copy of Let's Cook Healthy School Meals Cookbook. Project Bread's Massachusetts Farm to School Project LLC connects farmers with local schools to bring fresh produce to students. This innovative initiative promotes the purchase of locally grown fruits and vegetables by linking local farmers directly to school districts, and introduces fresh local ingredients into school meal menus across the state. The Massachusetts Farm to School Project became an LLC of Project Bread in 2013; the resources of Project Bread strengthen the administration and operation of this important project and further our collaborative work. Many students receive more than half of their nutrients and calories from school meals. Donate now and help children get healthy food where they learn and grow.